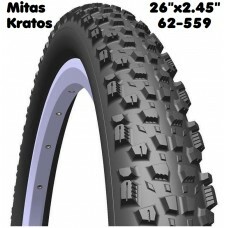 Anvelopa Mitas Kratos 26x2.45, 62-559, Sport MAX /29 TPI, 630g. Contrary to its rough and robust appearance the Kratos is not heavy. The Kratos is versatile enough to be considered by many as an all-rounder, but the Kratos really comes into its own when the trails get ugly. The Kratos has a big volume to dull down rough trails, coupled with an aggressive but consistent tread design to tackle the loosest terrain. The Kratos tread design is a special one. The consistent center-line gives low rolling resistance, while the outer edge is where the Kratos gets down to business. Widely spaced knobs dig into anything gnarly out on the trail and high performance CRX compound spreads over the terrain thanks to the ultra supple casing. Carbon Race Extreme LIGHT (CRX), predetermined especially for racing purposes. Tubeless Supra itself apart from the competition by providing trouble free installation, easy inflation and maximum air retention, coupled with a light-weight, high performance carcass. No other tubeless system can boast all these properties. Designed for use with a LIQUID SEALANT the Tubeless Supra is a high performance, easy to use, mess free system.